If we want to aid in the renewal of the Church on Guam, we have to deal with Kiko’s misuse of shame. With two decades of NCW influence on Guam, his teachings have soaked in on levels most haven’t even noticed yet. Sure, the heresies themselves are in-your-face and must be combatted, but there’s the stuff that’s unsaid that Kiko and his catechists teach that prepares the ground for the seeds of such evil. To my mind, there is one core Luther-an belief that is particularly destructive: that man is evil in everything he is and does, and Kiko himself is the way out of that evil. We are created in the image of God, and made for life and happiness. Aquinas himself says that of all creatures, only Man was created by God simply for happiness (and real happiness is God Himself). It was only by our sinning in the Garden that our nature became corrupted. But that corruption isn't complete. So how corrupted are we? After the Fall, we know the original Man (Adam and Eve), and therefore we, lost our “original holiness,” as the Catechism calls it. By succumbing to sin, we “become afraid of the God of whom they have conceived a distorted image - that of a God jealous of his prerogatives” (CCC 399). Spiritually, we hide in the Garden when the Lord comes to walk with us in the cool of the evening (Gen 3:8-10). That is shame for what it really is. But that's not the same as saying, "Adam, Eve: you are no better than the serpent. You are the scum of the earth for not having obeyed me. I never should have created you!" So there are two very crazy images of God. One is that He doesn’t exist (which isn’t an issue if you’re reading this). Two is that He is some Lord of Power who demands complete submission from His slaves—or else. This submission is the devotion found in Islam. And it’s the submission found in the NCW. The pious (no pun intended) of both groups find joy is absolute submission. All things are evil, or at least corrupt; by destroying the goodness of relationships and creaturely things in this life, they find an escape from the responsibilities that come with being a Christian who lives in the world, but not of it. THAT is why Kiko, Pius, and the others go on and on about how your family is your idol, your job is your idol, your hobby is your idol. All of these are, for them, just evils, having no intrinsic goodness on their own. It's taking the 1st Commandment and seeing it through this lens of "man is evil in all things." Sure, these things need to be understood in light of God, just as all creatures are loved for the sake of the Creator, but that doesn’t mean throwing out the baby with the bathwater. Family and work and even recreation and play are gifts from God for our happiness in this life and preparation for the next; they aren't evils. This is a submission born of a misplaced shame, and this kind of shame flows from self-loathing. For so many of us, hating ourselves—not the sin in us, but ourselves because of some inner belief that we are evil—is what passes for humility. The intellect is so darkened that everything feels like an accuser pointing a finger at us. We see this time and time again. Teenage girls who become “sluts” and are profoundly promiscuous tend to do so not from lust but from a need to feel loved, which is why it's so hard to bring them back from self-destruction. And because of the grave sin they commit to fill that hole in their heart, the need for love or acceptance is never satisfied. It just goes on and on, and it’s because they hate themselves, and not just because of their sin. They hated themselves first, and that started off a whole new sinful cycle. Or take a young woman who works for me. She barely survived a car wreck, was clinically dead for a few minutes, and then hospitalized for months. Her fiance was killed instantly. Even after two years, she wishes she had died. She hates herself because she survived. She's lives in a self-imposed shame. And that kind of pain cries out for healing, and if it doesn't get healing, it will take whatever it can get--including approval of self-loathing--to dumb it. In her case, it was meth, and that's a whole new world of pain and self-loathing. So when the NCW comes into people’s lives, it promises freedom from this sin: freedom from depression, bad marriage, alcoholism, you name it (and I know you’ve seen the signs). Invitation to Joy. And once they begin with the NCW, the catechists feed into that self-loathing by saying, “Yes, you are worthy of self-loathing. You are evil. Jesus loves you, but you're still worthless.” Then they offer the NCW as their get-out-of-jail free card. They offer themselves as the way to Heaven because there is no other way for such evil. Just ask them: what saved your marriage? 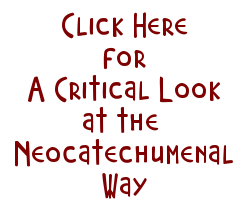 “The Neocatechumenal Way.” What helped you stop drinking? 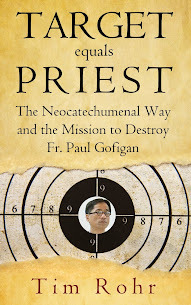 “The Neocatechumenal Way.” And so on. They rejoice because now everything is confirmed, all is justified. I am worthy of hatred. I should hate myself. Everything I touch turns to s*@t. But the NCW accepts me as evil because all of us are bad right through. But that isn’t humility; that’s indulgence in self-loathing and (in some cases) morbid self-pity. Of course God loves us no matter what, but we aren't called to hating ourselves. We weren’t created evil, and we aren’t evil, no matter what Kiko says. We do evil things, but it doesn’t have to be that way. That's the meaning of Christ saying to the woman caught in adultery: "Go, and sin no more." We are not helpless; we have His grace.We have the Church. If He loves us, then we are lovable, and to be lovable, there must be something about us worth loving. We are called to be like Him, to be conformed to Him. And He doesn’t loathe himself. Once we recapture what humility is, then we can earnestly strive for it, pray for it, practice it. Without REAL humility, we are incapable of truly adoring God for Who He Is: the God who is Love. We must be transformed in that Love to gain Heaven. Hatred of oneself is the exact opposite. Anything short of that makes contempt for our very being a virtue. And that’s a notion that Satan has down cold. And once Pius and the rest of these merchants of self-loathing are removed from Guam (Lord, deliver us!) this is one of many heavy burdens these poor, well-meaning Neos on Guam will need to have to finally let go of. And it's for us to be there to help them. Are there any references (articles, posts, videos, etc.) that lay out Kiko's sense of shame and self-loathing? If so, please incorporate them in your "to be continued..." If, as you say the NCW says, we are all despicably evil, how would we even understand self-loathing and shame? Doesn't shame presume a certain measure against which we see ourselves falling short? If we accept such a measure, then we have a conscience and can't be all evil. When we are at the point of applying the measure against which we have fallen short, we are at a cross-roads. Either we can continue to see ourselves as a lonely observer, despair and go the way of Judas; or we can see ourselves as God does: lovable sinner having committed hateful deeds. Yes, Timothy. Without stealing Junior's thunder, I can point to Kiko's twisted interpretation of the 9th chapter of the Gospel of John. See my post, Kiko's Mud, for more details. In short, Kiko uses the story of healing of the blind man with clay and spittle as a key text for his catechumenate. He says that the catechumenate will be a time when Jesus throws mud on the Christian, essentially shaming the catechumen. Unfortunately, as I show in my post, the Church Fathers interpreted John 9 quite differently and quite consistently taught that the use of the clay manifested Christ's regenerative approach to the blind man. That particular story is not about sin and shame. I can give you another example Timothy - in Kiko's own words, although you will have to understand that this is an indirect use of what Glaucon has correctly pointed out.
" we have always shown to the many brothers who have emerged from hell, full of wounds and of self-loathing, that in the Holy Eucharist the Lord makes present his love, dying and rising for them;"
This is precisely his intention - to convince his followers that they are unlovable, so that they convict themselves through self -loathing. This self-loathing in turn can only be relieved by "leaning on" the community. Insidious indeed. Calculated, cultic and diabolical. I'll be attempting to unpack this a bit more in the continuation, but in short: what you say about shame being indicative of our seeing ourselves falling short is precisely what humility is, not shame. Humility recognizes our intrinsic ontological goodness. Humility accepts that moral failure isn't a statement about that goodness. But more to the point, those in the NCW don't see this at all, particularly in conversations (including with priests Fr Pius and Edivaldo), posts, and my kids interactions with Neo kids. They see sin as making them permanently defiled, and redemption is God willfully overlooking the evil and loving them anyway--NOT salvation in Christ by means of purification, grace, and all else that the Church provides. And more than that, the NCW is viewed by them as the instrument through which such deliverance is given, and not through the Church Herself in Her sacraments. Pls know too that I'm trying to avoid writing an entire article on soteriology of NCW compared to the Tradition. This isn't the place for it, and very few would read it. Sorry, final thought, Timothy: the point to touch on (that knowing we have fallen short shows we have some goodness in us) is lost on most Neos. They aren't stupid; they just don't know. They don't see the inherent inconsistency of it all. But then again, what is perfectly obvious isn't always so obvious. Hence, our need to be there for them when Pius et al leave. What neo adherents are being taught is truly appalling. By chance I was talking with a lady I met briefly. We got to talking about faith and she admitted she is in the NCW. I can sense from her demeanor and mode of speaking that she is really sincere in seeking God. Yet she is also bothered her catechist saying that now they are being "hunted down" because of their neo loyalty. I started to wonder whether this is typical propaganda given the current atmosphere in our Archdiocese, and I really felt sorry for her. I told her that I am not going to badmouth NCW but I just cautioned her to be wise with her decisions, to never to lose a sense of self-respect and independence to distinguish between brainwashing and authentic life-giving faith. God help them!